Introduction: In this article, Scott Phillips tells the story of how a fellow genealogist used old newspapers to finally break through her family history brick wall. Scott is a genealogical historian and owner of Onward To Our Past® genealogy services. Here on the GenealogyBank blog, I recently wrote an article titled Ah-Ha! Moment: GenealogyBank Member’s Favorite Family Find. At the end of my article I asked readers to please share their own “Ah-Ha!” moments from their genealogy and family history work. I then learned about “Cowfordlady’s” genealogy “Ah-Ha!” moment, which had occurred earlier that same day. GenealogyBank member Cowfordlady kindly shared her genealogy success story with us so that we could share it with all of you. It is a story about breaking through a genealogy brick wall similar to those we each encounter in our own family history work. Cowfordlady had been searching for some clues to two of her ancestors who were missing from the 1940 U.S. Census, so she turned to GenealogyBank’s online Historical Newspaper Archives in the hope of perhaps finding an obituary. What she found was indeed an “Ah-Ha!” moment of epic proportions. She overcame the challenges of assumed names, misspellings, cross-country movements, 15 missing years, murder, and more! She had been unable to find information about her ancestors Flossie Sula (mother) and Louise (daughter) Cothern. Cowfordlady knew that Flossie Sula had married David William Cothern, and Louise was their only child. He died in 1930. Flossie was a widow and about age 33 when she and Louise left West Green (Coffee County), Georgia, in/about 1931; Louise was about age 9 then. After that, her ancestors’ trail turned cold, and they were not listed in the 1940 Census. Not able to find any information about her ancestors in government records, Cowfordlady turned to GenealogyBank’s newspapers. She tried several searches using variations of her ancestors’ surname—and one such variation (“Cothren”) turned up an article that was the key to unlocking this genealogy puzzle. 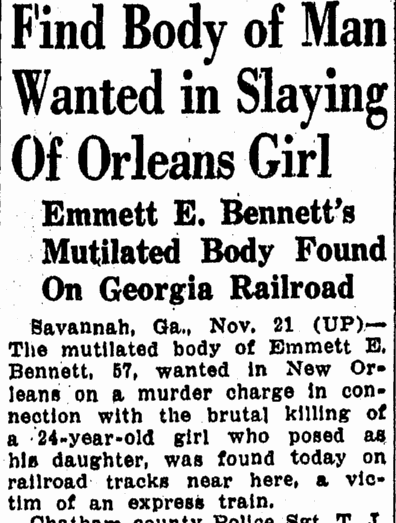 It was a front-page story from a 1946 Louisiana newspaper that began to unravel the mystery. The discovery was a chilling one. The key was this paragraph, revealing that the unfortunate “Mrs. 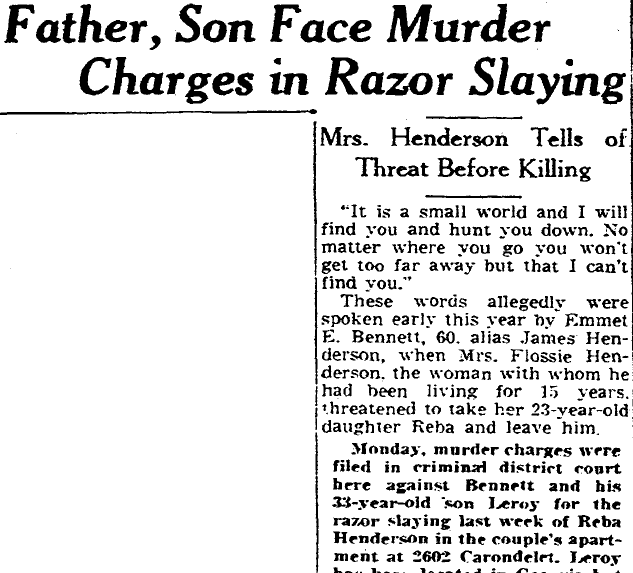 Henderson” involved in this tragic murder story was in reality Cowfordlady’s missing ancestor, Flossie Sula Cothern (spelled “Cothren” in the article). Along with finally solving the mystery of her missing ancestors, this newspaper article had the added bonus of providing a photograph of Flossie Sula Cothern. Flossie Sula and Louise Cothern had left Georgia with a father and son who lived near them: Emmett Bennett and his son Leroy. 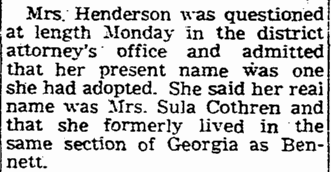 The four of them lived as a family for 15 years under the assumed name of Henderson until Emmett (in the company of Leroy) murdered Louise in 1946 in New Orleans while Flossie was at work. 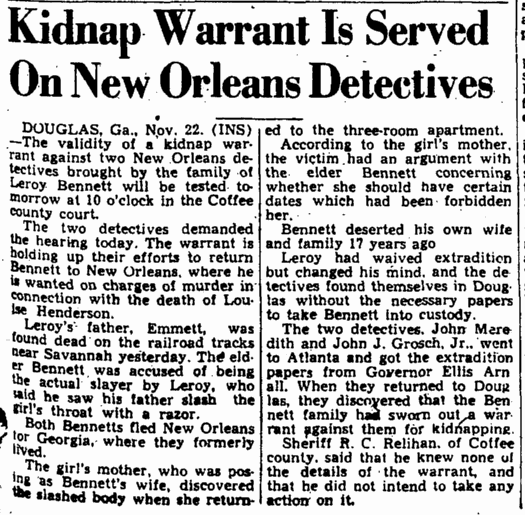 Cowfordlady’s discoveries continued when she found another 1946 Louisiana newspaper article. It seems that while on the lam from the law, the apparent murderer of Louise possibly committed suicide by allowing himself to be hit by an express train. But that was not the end of this story! There is a follow-up in this 1946 Georgia newspaper article. 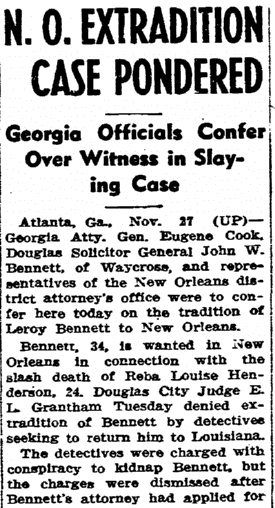 It seems that the second suspect in this murder case, Leroy Bennett ( “Henderson”) had changed his mind about accepting extradition to Louisiana from Georgia—and his family then swore out a warrant against the detectives for kidnapping! Coffee County Sheriff R. C. Relihan said today that a mental health hearing for the young Bennett this week disclosed him to be mentally incompetent. He was placed in the custody of an uncle and attorneys. As you can see, Cowfordlady went from near-zero information to uncovering an amazing story about her missing ancestors. Her experience shows the value of newspapers for family history research; they provide the stories that vital statistics, with all their names and dates, don’t tell. And her technique of searching on variations of her ancestors’ name—and her dogged persistence—provide good lessons for us all! There may be nothing finer in genealogy than when we see success such as Cowfordlady’s. What has your best genealogy success story been? This can not be a story of Cowfordlady’s ancestors because Flossie had no surviving descendants. Instead, this is a story about a relative of hers.